At Josoft, We are a dedicated team of professionals committed to building strategically engaging online content and optimization tools for your target audience, with the help of which you can build the customer base you wish to do. With Josoft Technologies PPC services, you can fuel your company's business with high-quality traffic and see the conversions grow. PPC enables you to get instant returns and as a registered Google Partner, we are competent to make your campaign for AdWords up and running in no time. Optimizing an AdWords campaign is now accessible, and you can easily target your ideal research phrases and reach the top of Google's search engines with our PPC services. With the assistance of our PPC experts, you will be able to attract new customers to your business immediately. Pay Per Click Advertising (PPC) is an effective advertising model. Besides, this is a completely paid form where you can increase your awareness in search engines. This is a great way to get traffic to the website at the time required. Here the quality of the website is ignored, but traffic is guaranteed in every way. Here, we run a campaign based on a specific budget, and in these campaigns, you can put all the things you want your users to see. Our PPC management specialists work diligently with you to meet your company's marketing needs and more. 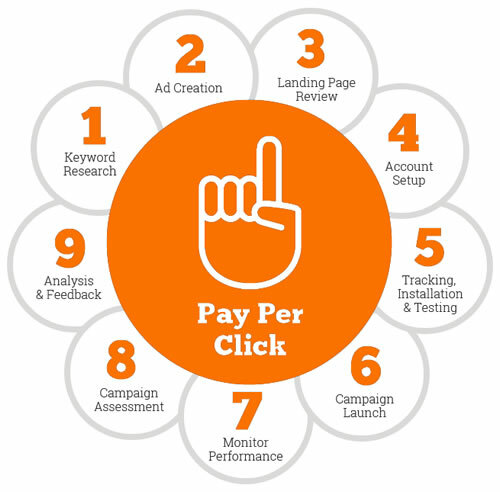 Our team has been proven to be a typical PPC campaign organization, which makes your campaign a profitable marketing process by increasing your sales and lowering your cost per click. We can set your ads per click movement using MSN AdCenter, Yahoo Search, Google Adwords and other pay-per-click engines. We design PPC campaigns in such a way that ROI is increased by clicking on the capitals. (CTR) and conversion rate.